Here at HubSpot, we've told fellow marketers about the importance of creating compelling video content to engage your busy audience. And for the most part, video content lives on social media channels -- like Facebook, Instagram, and YouTube. But we wondered if video content had a place on our blog as well. Marketers are prioritizing visual content, but many marketers don't know how to start -- and others worry that video will disrupt and replace written blog content altogether. Changing content preferences are an opportunity to innovate, not a reason to be afraid. Read on for our latest data about how content marketing is shifting and for a deep-dive into our first experiment turning blog posts into compelling video content. We surveyed more than 6,000 marketing and sales professionals to learn how they're changing their strategies to meet the preferences of the modern consumer. And a lot of the chatter was on the subjects of video content and social media. Almost 50% of marketers are adding YouTube and Facebook channels for video distribution in the next year. 33% of inbound marketers listed visual content creation, such as videos, as their top priority for the coming year. 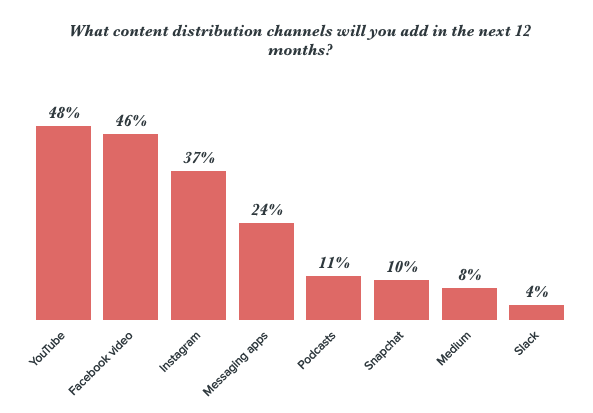 Video content fell below the top two priorities -- growing SEO presence and creating blog content -- but it occupies the minds of a large part of the marketers we surveyed. It was on our minds too, which inspired the experiment. Read on for the details and the results. My colleagues Jamee Sheehy, Nick Carney, and I wanted to learn if producing video content would improve traffic to HubSpot Marketing Blog posts and social media channels. I kept hearing that our audience wanted more video content. In a 2016 HubSpot Research survey, almost 50% of respondents said they wanted to see more video content and social media posts, so I wanted to start there. Between February and May of 2017, I worked with the team to publish video content for seven new blog posts. We published video content on YouTube, Facebook, and on Instagram Stories. For some blog posts, we published videos on both YouTube and Facebook. The YouTube and Facebook videos were then embedded into the blog posts for cross-promotion, and all of the videos on Instagram, Facebook, and YouTube linked to the blog posts. We embedded a YouTube video in the blog post and published the same video natively on Facebook. The YouTube video achieved a 55% view-through rate: The average watch time was 0:41 of a 1:14-long video. The YouTube video contributed more blog traffic than the Facebook video. The topic choice reflected in the lower-than-typical number of blog post and video views across the board -- video topics should be either highly visual or more universally compelling. This was the highest-performing blog post and YouTube video, and the second-highest performing Facebook video in the entire experiment. The topic is interesting whether you're a marketer or not, and there is a lot of search volume around the topic. The video isn't highly visual, but the interesting topic helped drive video and blog post views. The YouTube video achieved a 72% view-through rate: The average watch time was 0:53 of a 1:14-long video. We published a video natively on Facebook and embedded it in the blog post. Although neither the blog post nor the Facebook video achieved a huge number of views, the Facebook video drove a meaningful portion of views to the blog post on the day it was published. A technical difficulty forced us to re-upload a new version of the Facebook video, which lost us a few thousand views. The video featured video b-roll and animations instead of talking heads -- and it performed well on Facebook (thanks to Nick Carney's video editing skills). The video was published on a Friday, when people might be more willing to browse Facebook and watch videos -- this could account for the first-day jump in video views. A cool video doesn't necessarily mean viewers will click through to read a blog post -- this video was so informative, it stood on its own and didn't impact blog traffic much. We published this blog post later in the day to cover the conference, so it wasn't sent out with our daily subscriber email -- the likely reason for low traffic on the day it was published. This is another example of a high-performing Facebook video that didn't translate into high blog post performance. We published an Instagram Story with the option to swipe up to read the blog post. The Instagram Story wasn't published on the same day the blog post was published, so attribution numbers aren't as straightforward. The Instagram Story generated the vast majority of referral traffic, and it was a big driver of traffic overall. 7) Are Notifications Driving Us Crazy? Here's another example of a high level of Instagram Story engagement. The blog post achieved a low number of views overall, but it's meaningful that Instagram Story viewers clicked through to read the blog post and weren't just absently scrolling. The Story drove 65% of social traffic on the day of and contributed to the final social referral percentage -- which is a higher than other posts in this experiment. We've already learned a lot from the experiment -- here are the biggest lessons we'll take into the next phase of turning blog content into videos. 1) High-performing Facebook videos didn't necessarily result in a lot of blog traffic. A big part of the videos' high view numbers on Facebook is undoubtedly thanks to the filming and editing skills of our team. But I think it's also a reflection on how thorough and engaging the videos were -- the viewer might not have needed to click the blog post to read more about a topic they'd already watched a video on. Facebook videos might better serve as standalone pieces of content rather than traffic drivers to blog posts in our case, but in some cases, both the blog and Facebook worked symbiotically. 2) What goes "viral" can depend on the medium. The best-performing blog post and YouTube video topic -- as well as the second best-performing Facebook video -- was the social media holiday calendar. In this case, the blog post views and the Facebook views increased rapidly alongside each other. I chose the topic based on keyword search volume and created a blog post and video that are useful and interesting to anyone on social media -- which contributed to the high number of video views and a large amount of organic search traffic -- 20% of the total traffic to the post. Still, there was a relatively low amount of traffic to the blog post from the Facebook video -- another reason to believe that Facebook posts might not be the biggest blog traffic driver. The blog recap about the F8 conference achieved a smaller number of views, but the Facebook video was the best-performing in the entire experiment. Based on this experiment, news coverage and lifestyle content perform best on social media, while keyword-specific content performs better on the blog. For future video blog content experiments, we'll try to create content that checks off both boxes to get another hit for both media. 3) Instagram Stories drove a high percentage of clickthroughs to the blog posts. We found that the Instagram Stories we published resulted in a high percentage of clickthroughs to the blog post. In these examples, the blog posts didn't achieve a high number of views overall, but a huge portion of social traffic the day of posting could be attributed to the Instagram Story. This means viewers weren't just clicking through Instagram -- they were watching stories and following the desired call-to-action to read the blog post. We'll continue using this engaged audience to promote content on Instagram. For the next installment of this experiment, we're focusing on a keyword-based strategy. We'll experiment with updating older, high-performing blog posts with new video content on YouTube and optimizing the post and the video for Google and YouTube search, respectively. We'll publish more tactical, instructional videos for people conducting YouTube searches, and we'll experiment with a greater variety of video creation and editing skills. And on our social media channels, we'll cover more breaking news in the technology space and more lifestyle content we've seen do so well. Next on the blog, we'll cover more resources for how to create video content on your own, and coverage of more interesting experiments we're doing here at HubSpot to learn more about our audience. In the meantime, download the 2017 State of Inbound Report to learn more about the latest data and insights from marketers around the world. Have you started experimenting with video content on your blog? Share with us in the comments below.